We sort wearables into two broad categories: Fitness bands and smartwatches. Fitness bands are the low-priced, lightweight, fitness-focused devices that count steps and measure sleep, while smartwatches serve as an extension to a smartphone delivering notifications, phone calls, and more to your wrist. The line between these fitness bands and smartwatches continues to blur, as more companies introduce full-featured wearables dedicated to both health and communications. If you’re looking for a wearable to motivate you to be more active, track your calories, or even log your sleep patterns, then you’ll be surprised by the number of choices available — both smartwatches and bands. We’ve collected a handful of the best fitness trackers to help make the buying process a little easier. Why you should buy this: You want a fitness tracker with outstanding battery life and a thin, stylish design. Who it’s for: People with an active lifestyle who want all-day fitness tracking and useful smartwatch features. There’s a reason why Fitbit is on top of the fitness band market — the company continues to improve its bands by slowly and steadily adding smartwatch features and streamlining design. The Charge 3 is the newest tracker in Fitbit’s lineup. The Charge 3 has a sleek look with a button-less design that makes the band look thinner than it actually is. It’s an ideal size that is not too big for a woman’s wrist and not too small for a man’s. The concave shape hugs your wrist and is so light that you don’t even notice that you are wearing it. The band has a grayscale touchscreen display and a button with haptic feedback that serves as the home and back button. The Charge 3 has Fitbit’s full suite of fitness tracking including all day heart rate monitoring, all day step counting, SmartTrack to automatically recognize workouts, and even period tracking for women that can be added as an option to the dashboard. All these metrics can be viewed in the Fitbit app, which still has the best app interface for health and wellness tracking. The wearable also has a handy auto-stop feature that pauses your exercise when you encounter an intersection or have to tie your shoe. It also uses new goal-based exercise modes that let you set a goal and track how far or how long you need to go to complete it. On the smart notification side, the Charge 3 can receive and respond to text messages, answer or reject calls and even get social media and email notifications. Why you should buy this: You want a stellar fitness band with GPS, a display, storage for music, and some smartwatch capability. Who it’s for: Any Android user who’s teetering on choosing between a fitness band or a smartwatch. Like the Fit 2 before it, Samsung’s Gear Fit2 Pro is a sleek and lightweight fitness tracker that stands as one of the best we’ve ever reviewed. Featuring a healthy dose of smartwatch capability, the option to store and stream music, built-in GPS, and water resistance, it’s a refreshing, cost-effective wearable. It does still feature the same, somewhat bulky design as its predecessor but that’s a minor nitpick on an otherwise powerhouse of a fitness tracker. Featuring a 1.2-inch Super AMOLED screen with 320 x 320 resolution, wearers are treated to a stunning, crystal clear display. This is especially useful when scrolling through the wearable’s daily metrics of steps counted, calories burned, flights of stairs climbed, and the host of typical fitness data. It even offers up a Google Maps-type map after logging a run or bike ride via its built-in GPS, displaying the exact route taken. When listening to music either stored directly on the watch or via Spotify, the interface is easy to navigate, even while on the move. In addition to its subtle nudging feature, the Gear Fit2 Pro also offers accurate auto-tracking of a wide range of activities. Fitness-tracking aside, Samsung’s inclusion of smartwatch functionality adds a welcome touch of versatility. Capable of sending notifications for Facebook and Twitter, phone calls, text messages, and phone calls, it even allows for quick response actions to be programmed directly on the wearable itself — though this is only compatible for calls and texts. Despite the fact it does offer some iOS support, only Android users have the option of sending responses. Priced at $200, the Samsung Gear Fit2 Pro is not only the best fitness wearable for Android users, it’s one of the best fitness wearables on the market in general. Its minimal design and comfortable fit perfectly compliment the suite of fitness tracking and smartwatch features, allowing it to easily stand out in an increasingly crowded market. Why you should buy this: You want the absolute best fitness tracker and smartwatch for use with iOS. Who it’s for: Any iPhone user who is looking for a full-featured smartwatch that also tracks fitness activity too. For iOS users who have the money to spend, there is no question the Apple Watch Series 4 is the best full-featured fitness tracker available. Like the iPhone itself, Apple’s wearable has a good deal of support from third-party developers, with every major fitness app offering compatibility. The Watch also found a way to deftly mix features and fashion into a single wearable device, offering all-day battery life and a host of features that are tough to find on any competing device. The chief upgrade for the Series 4 over the previous-generation Apple Watches is the electrocardiogram (ECG) app, which has been certified by the Food & Drug Administration, making the Apple Watch Series 4 the first over-the-counter ECG alternative for consumers. The latest Apple Watch also offers a larger screen and two-times better performance over the Series 3. 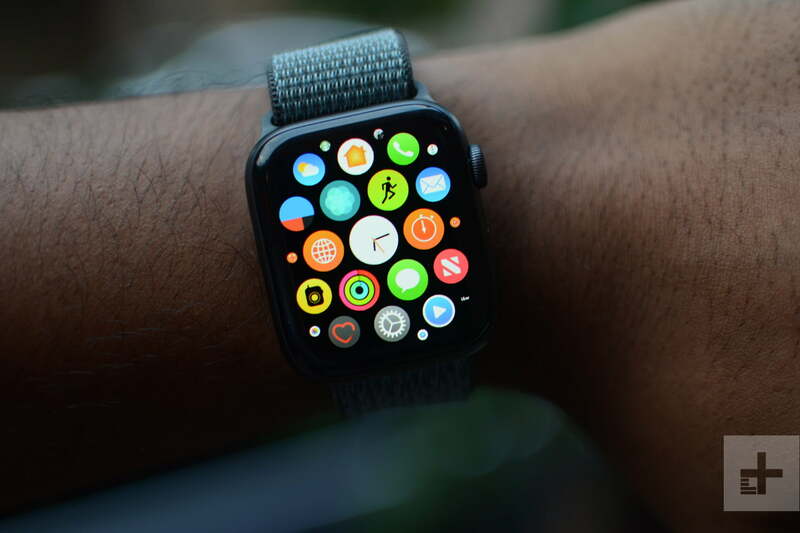 We all know the Apple Watch delivers plenty of functionality, but its more fitness-oriented features include GPS tracking, an altimeter that records changes in altitude, and onboard heart rate monitoring. It’s also waterproof down to 50 meters, offers support for a broad number of workout types, and even reminds you to stand after periods of inactivity. Throw in Bluetooth connectivity with wireless headphones and greatly improved Siri support, and you have a smartwatch that’s head-and-shoulders above just about anything else on the market. All of this comes at a price. The Apple Watch Series 4 starts at $399 and goes up from there depending on size, the style of the band, and the inclusion of cellular connectivity. For those who already live in Apple’s ecosystem, this is just another extension of that platform, offering versatility and convenience in a stylish package. Why you should buy this: The Withings Steel HR Sport embeds a powerful fitness tracker into a classic analog watch. Who it’s for: People who want fitness tracking and smart notifications but don’t want to sacrifice their traditional analog watch. The Withings Steel HR Sport blends the elegant styling of an analog watch with a no-nonsense fitness tracker and connected smart features. The Steel HR Sport is one of the most comfortable smartwatches we have tested. The band is soft to the touch and is well ventilated. The casing is lightweight and curves to fit your wrist. The timepiece is a hybrid smartwatch — it doesn’t have a touchscreen and only a minimal LCD on the watch face. The watch tracks everything behind the scenes using subtle vibrations to alert you when a notification comes through or when you reach your step goal for the day. If a buzz isn’t enough, the Steel HR Sport also displays these alerts using the small LCD display. Because the LCD is so small, the alert text scrolls automatically so you have to be quick to read it. The Steel HR Sport is no slouch when it comes to fitness tracking. The watch monitors your heart rate 24/7, tracks your sleep patterns, and counts your steps. When working out, the Steel HR Sport has profiles for a variety of indoor and outdoor sports. When exercising outside, the watch uses connected GPS to measure your distances and provide a GPS track on a map. The watch connects to Withings’ app, which is the hub of your fitness experience allowing to you customize the notifications you receive on the watch and to analyze your fitness data. Why you should buy this: The Vivosport offers full-fledged fitness tracking and running-specific metrics in a small package. Who it’s for: Anyone who wants a full-featured GPS smartwatch tucked into a fitness band. Garmin’s Vivosport is an attractive option for multi-sport athletes who prefer a lightweight band over a larger smartwatch. Its selling point is the integrated GPS, a feature not often found in a fitness band, and easy-to-read color display. The tracker also has a heart rate monitor, sleep tracking, and automatic workout tracking. Designed for the outdoors, the Vivosport is water resistant to 5 ATMs making it perfect for running in the rain and swimming in the pool. Runners will appreciate the dedicated running features — including personal records, a virtual pacer, Auto Pause, Auto Lap, and a walk/run mode. You can sync the tracker with the Garmin Connect app to view detailed metrics and track your progress over time. The app also offers weekly challenges in which you compete with fellow Garmin users if you need extra motivation to achieve your goals. The Vivosport tracker is integrated into the band, so you can’t swap out bands like you can with the Fitbit Flex 2. Garmin does offer a few color and size options for the Vivosport including Fuchsia Focus in a small/medium band, Limelight in a large band and Slate in both small/medium and large. Why you should buy this: The Fitbit Inspire is a sub-$100 fitness tracker that’s high on features and performance. Who it’s for: Budget shoppers who want a basic fitness tracker for steps, sleep, and stress. The sub-$100 Fitbit Inspire is ideal if you’re looking for a budget fitness tracker — few fitness bands on the market delivers the same core features at this price. You can use the band to track your steps, workouts, sleep, weight, water, and stress (HR model only). It’s a step up from other affordable fitness bands that have limited tracking and a simplistic display. Speaking of the display, it is a perfect size for a stylish device. It is big enough to allow you to view incoming alerts and exercise statistics but small enough to not look overly big on your wrist. It’s a no-nonsense wearable that helps you improve your fitness while looking great on your wrist. The tracker is so compact and lightweight that you will hardly feel its presence. It has a clean, rounded look which is a refreshing change from Fitbit’s older boxy designs. The Inspire model uses Fitbit’s quick-change bands allowing you to change the look of the device in an instant. Want to go out to dinner? No problem. Just swap out the sports band for the classic mesh metal band before you hit the town. Fitbit launched the Inspire as a series that include both the entry-level Inspire and Inspire HR. The most significant difference between the Inspire and the Inspire HR is the wrist-based heart rate monitor on the HR model. This feature adds $30 to the price tag of the device and enables advanced metrics like resting heart rate and stress management. With a price tag under $100, there is little reason not to recommend either the $100 Inspire HR or the $70 Inspire for someone looking to track their fitness with minimal investment. We test fitness bands just like we test smartwatches. That means using them every day and testing out all the marquee features. We strap them to our wrists (no matter how silly they look) and walk around town with them, take them to bed with us, and hit the gym to test out the workout features. It’s also key to pair them with different phones and test the experience when the band is connected to phones different operating systems. If a fitness band is water-resistant, we dunk it in water, and if it has GPS, we go on a hike. A fitness band’s companion app is also very important because it can mean the difference between getting fit or throwing your new band in the garbage. Now is as good a time as any to buy a fitness band. Battery life is improving, built-in GPS tracking is far more common, and heart rate monitors are making their way onto more devices to ensure accurate measurements. The tech isn’t likely to advance too dramatically, for now, so you’d likely get several years out of the options listed — if you stick with them. The biggest detraction to buying a fitness band is that you may not use it enough to justify spending the money on pricier options like the Apple Watch. Those are recommended for fitness buffs who are actually going to use them to track workouts and train for races like triathlons or 5Ks. The rest of the bands on the list are suited better for a more casual crowd looking to track their fitness levels and maybe lose a little weight.